peppilepew wrote: I am using 64gb cards. They record the data fine. I can access the data through wifi. I have two power supplies wired in. I power 1 camera per supply and leave the other port for future use. The firmware is from a month ago. Ok so what's not working then? Help us understand what you need help with. I can not get the video to stream on my computer. It won't recognize the format. peppilepew wrote: I can not get the video to stream on my computer. It won't recognize the format. "Steaming" means you're trying to watch via wifi. That only works via iOS and Android app. Wifi playback doesn't work via Windows/Mac. You need to remove the card and use a microSD USB card reader. peppilepew wrote: This goes to Pier28. Why cant I open the SD and select the files for normal viewing without jumping through hoops? I am sure enough of these will sell to finance such a program. Why not supply one? I am not the only one having problems with this. I don't own one of these but I've never had an audio nor video device that records to SD, no matter the format, that you couldn't browse the files and open with a player of your choice. I'm sure this camera is no different. What is special about this device that you can't open and view a .mov file? Correct. I just browse them on my PC and play them with VLC (which is free). I use 64GB cards as well, they work fine for me - except for updating firmware. For whatever reason, it won't update the firmware from a 64GB card, so I use a 16 GB card for this. Scott, which viewing option so you use? peppilepew wrote: Scott, which viewing option so you use? I just pull the card out, stick it in my computer, pull the files off, and use VLC to view them. Motorcycle: 2013 GL1800 Airbag Red of course. Well finally installed my BulletHD Biker Pro on my 2013 GL1800 Level 4 and WOW, great video after a short ride testing the unit. Did the firmware update as described and started recording a sunny day ride. Got home and put the 64 Gig Micro SD card into a Lexar USB/Micro SD adapter and downloaded all the videos to my iMac 2.5 Ghz Intel Core i5 computer. Everything worked great & no issues viewing any of the 2 minute videos, all 29 of them. Admin I'll try your electrical tape fix for a slightly off kilter picture. Pier28 I do have a question? I know just enough about computers and my Mac to be dangerous but when it comes to the BulletHD settings I haven't a clue what they should be. Could you suggest the setting for the camera for best video and recording settings. The best for me would be list each setting in order as they appear on the setting screen as I see them on my iPad Mini. Orrrrrrr are the factory setting good the way the are? If so in light of my described bucket list tour to The Maritimes and Newfoundland what duration of video record would be best. Thanks again for all your help guys. Ride safe everyone or at least ride like they are out to kill you! Eboness wrote: Pier28 I do have a question? I know just enough about computers and my Mac to be dangerous but when it comes to the BulletHD settings I haven't a clue what they should be. Could you suggest the setting for the camera for best video and recording settings. The best for me would be list each setting in order as they appear on the setting screen as I see them on my iPad Mini. Orrrrrrr are the factory setting good the way the are? If so in light of my described bucket list tour to The Maritimes and Newfoundland what duration of video record would be best. Thanks again for all your help guys. Welcome to the BulletHD club. Eboness wrote: Have not changed anything as of first install of camera. So I guess it's at factory right now. I'm in Hong Kong until the 18th do won't have access to a sample settings.txt file for awhile. Please list the default one here and I'll explain each setting if its not Clear. Eboness WingAdmin did a great install of camera on a GL1500. 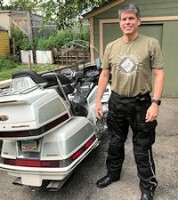 I was looking at putting on my 89 Gl1500, but it is now up for sale, moved up to a 2006 GL1800. So my question to you is where did you mount the camera? Thank you, I will see tomorrow. I in MST. Ride safe and often. side of the wing, left of the battery, up to the space below the left pocket. I then attached these two leads to the controller. under side of the fairing, as the first two photos show. That's pretty much it as for installation. Hope this helps you in your BulletHD installation on your GL1800. Eboness wrote: I have a question for Pier28, I'm going on a bucket list trip of a lifetime this summer, which will involve shipping two Gold Wings and two cargo trailers via Air Canada from Vancouver B.C. to Montreal, QC. We will then ride to The Maritimes and Newfoundland and then ride back to B.C. all in a little over a month. The reason I bought the BulletHD Pro was to video the trip, now here's the question. I don't want to carry around a ton of 64Gig MicroSD's so I found this solution. At the end of each day I'll remove the MicroSD card and put it in a Kingston Mobilelite Wireless G2, http://www.kingston.com/en/wireless/wir ... ders#mlwg2 then plug a 1TB SSD portable drives into the G2 to transfer the video files I decide to keep of each day's ride. Do you think this is the way to go for video storage while on this trip? We will not have a laptop on this trip and we only use iPad Mini's for internet. Thanks for your or anyone else input on this storage issue. I finally got to try out my Kingston MobileLite G2 and Adata HD650 External HDD 1TB drive as a place to save my vacation videos. After placing my 64 Gig MircoSD, from my BulletHD Pro, into a SD Adapter I then placed it into the G2. Following the directions & with in less than 2 minutes all my video files were placed safely into the HD650. This setup will work great for storing all my videos at the end of each days ride will touring Newfoundland & The Maritimes. Check out this video I found on Youtube on the procedure for placing video files from a Micro SD to a external hard drive. FYI: The all new May 2016 - Biker Pro Plus is now in stock! (Aluminum Metal Lens Housing, New Packaging with Pre Assembled Cables, Free 32GB Transcend 400x Premium microSD card included) Here is the Amazon listing, our main site and ebay listings and details will be adjusted over the next few days. thanks to your original post here, i bought the BULLETHD biker mate.. (no wifi) but am EXTREMELY happy and satisfied with the video quality. I only have one question that i hope you can answer. My BulletHD, only records for blocks of 20 minutes. No matter what setting i use. after the 20 minutes, it keeps recording however but i can't view any of those recordings. example.. i have 10 5 minute videos, i can only view 1-4 but 5-10 give me error messages. I keep getting error messages that the file is damaged or corrupt. i contacted the BULLETHD support and they recommend i change and use a better quality memory card. i see you posted a picture with the two memory cards you used and seeing that you have had no issues with yours, can you tell me if you've had any issues with your recordings or can you tell me what memory card you use and are still using? This unit is simply amazing and as most riders out there.. i don't just go for a 30 minute ride, i go for a full day tour somewhere and most times i get lost on purpose and try and find my way back home and stumble across some amazing sites. Thanks as always for this amazing web site and forums. I've learned so much and have done so many things to my bike that i would have been afraid to do in the past. You'll never find a motorcycle parked in front of a Psychiatrist's office.... Just saying!! vantage2 wrote: thanks to your original post here, i bought the BULLETHD biker mate.. (no wifi) but am EXTREMELY happy and satisfied with the video quality. I only have one question that i hope you can answer. My BulletHD, only records for blocks of 20 minutes. No matter what setting i use. after the 20 minutes, it keeps recording however but i can't view any of those recordings. example.. i have 10 5 minute videos, i can only view 1-4 but 5-10 give me error messages. I keep getting error messages that the file is damaged or corrupt. i contacted the BULLETHD support and they recommend i change and use a better quality memory card. i see you posted a picture with the two memory cards you used and seeing that you have had no issues with yours, can you tell me if you've had any issues with your recordings or can you tell me what memory card you use and are still using? The two cards you see in the image are a 64GB Samsung and a 32GB Transcend. The Transcend was the one that was sent with the unit for review, and it works great with it. It is a class 10 SDXC card, which means it is fast. Both cards work equally as well in the unit. The 32GB card gives about 3-4 hours video, while the 64GB offers double that. If you want to update the firmware in the camera, I have found that it WILL NOT accept a firmware file from the 64GB card. It just pretends the firmware file doesn't exist. It works fine using the 32GB card. So while I use the 64GB card for everyday use, I keep the 32GB card handy as well in case I need to do firmware updates (or for use as a spare). I had the same problem with my cheeeep car cam. It see my 32GB card but not the 64GB. But I cheated? I partitioned the 64 into two 32 drives and it sees both drives. Only other problem is my cheap cam I have to manually set which drive to use.